Are you one of them who feel tired even had a full night’s sleep? Wouldn’t it be great if there is way that allow to keep track your sleep better using Android smartphone and wake up feeling more refreshed? Do you forget you are living in digital age, but there is always a solution for every problem. In this case there is an android app called “Sleep As Android‘, this interesting app for your Android device allow you to transform how you sleep. This app allows you to keep track your sleeping. Usually people have light night and deep sleep. 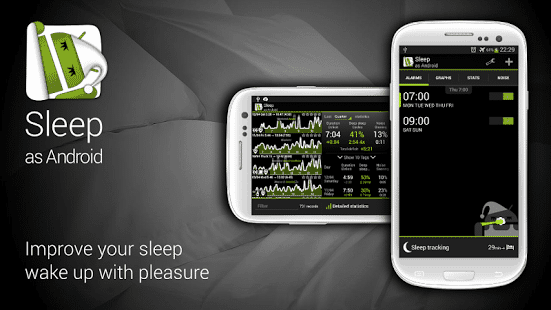 Whenever you are going to sleep, open Sleep As Android and click on Sleep Tracking button. You can also go into Statistics to check hours you are sleeping. This app has also a Smart Wake Up option that helps you to wake up at right time so that you do not feel tired. Alarm clocks will normally wake up you at time you set them, doesn’t matter you are in deep sleep or light sleep. If you wake up at time while you are in deep sleep, you are going to feel tired and sleepy rest of day. But when you wake up at time while you are in light sleep, you feel relax and refresh from night sleep. All you have to do for this choose a time rang in which you want to wake up. 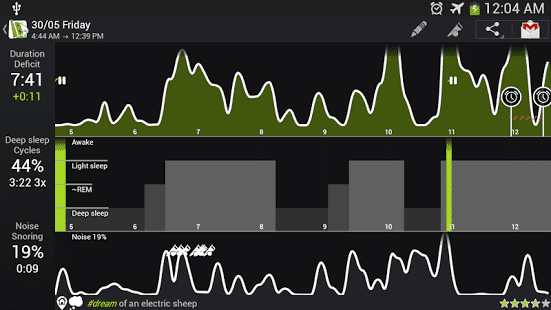 Using Charts on Sleep As Android app, your sleep timing will monitor at night and will wake you up at right time. You can set alarm on this app, time you wish to be wake up by going to Settings> Smart Wake Up> Smart Period and set time when you want to wake up. Do you feel difficult to wake up with alarm clock? Do you ignore alarm in sleep? Well if you are one of them this app has a solution for that. It comes with CAPTCHA Alarms, means if you want to turn off alarm when it’s ringing, you will have to solve a mathematical question or a puzzle or require to shake your phone. Enable CAPTCHA option and what type of CAPTCHA you want to solve. There is also a feature in this app that allow user to record their sleep talk and snoring noises. If you are getting trouble to sleep at night, Sleep As Android app allow user to play background sound like Fireplace, Old clock and much more which helps user to relax.